OK, (2009-03-05) things got dried out and are working better, if not perfectly. It appears that between about 11:00 AM and 2:00 PM I get a few read errors from the wind head each day. 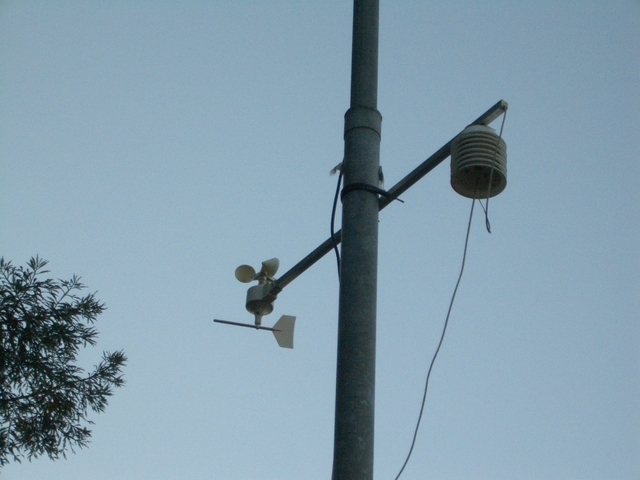 And the anemometer appears to run less freely than when I first put it up, yielding even poorer measurement of low wind speed and perhaps wind speed overall. Direction seems to be working fine, however. It will be interesting to see if the new AAG Elecronica wind head will work on a simple 1-wire link (plus power). It certainly looks like a major program change will be required. The 1-wire instruments are failing. Readings are no good. 2009-02-18. But you may want to take a look at the weather pictures in the Gallery. Here you will see some new pics of the inside of the wind head. As I was working on the major pieces, trying to figure out what was broken, I noticed water dripping onto the floor from the wind head. Well, it had been up in the rain for two years, so it may have taken on some water. Sure enough, it was pretty wet inside. But I also found that the construction quality control was much worse than the parts I have built with a soldering iron. One of the reed switches is rolled about 90 degrees, so the magnet closing it will be much less effective. I don't know how much difference that makes in the direction readings, but probably not as much as the big trees shading the entire SouthEast side of the yard. At this point things are drying out before I put them back together and re-seal the wind head with more calking compound. The wind head gives direction, velocity and gusts. The pagoda, made from cheap plastic soup bowls, gives temperature, humidity and solar energy (with a photodiode). The solar energy often saturates, as a different size resistor is needed in the circuit. There is also a temperature sensor in the weather head, but it overheats in direct sunlight due to lack of ventilation. Therefore the recorded temperature is an average of the temperature sensor built into the humidity chip and the temperature chip in the pagoda. Come back next month for barometer readings and rainfall, assuming these new devices work as planned. The crossbar is up about 18 feet on a tower supporting a long wire and a dual band (2M/70cm) vertical for amateur radio station AA6AV. This weather data is collected using hobbyboards implementations of Dallas 1-Wire instrumentation. Data is stored every 5 minutes into a mysql database and into RRDTool for display of the graphs. Since the home weather station was a Christmas present in 2006, mysql data goes back to January 2007, with a few glitches as problems got ironed out. Software is perl scripts running on Ubuntu Linux. August 30 - working on the new barometer. Loss of info and weird readings are due to missed readings and program bugs when starting up the new barometer. The barometer seems to be working just fine now, and the calibration seems to be very close to the Napa Airport. Napa Airport data is also stored in mysql, on an hourly basis, and goes back one year farther than the home weather data. These display graphs are coded in php. Data loss on 2007-11-08 from RFI. Looks like some shielded CAT5 is in order.